“You are so precious to us! It’s only when you were taken away from us that we realised how indispensable you are,” squealed Umm Hussam as she embraced Zinat al-Jallad, commonly known as Umm Ihab, in a tight embrace. It was Umm Ihab’s first day back among her “sisters’ in Bab Hutta in the Old City after four days in an Israeli jail and an additional five days under house arrest. There’s little need to ask the women gathered around Umm Ihab how much she means to them as their reception of her speaks volumes. The 61-year-old cuts a motherly figure even to her older friends. “We couldn’t sleep when she was arrested,” Ikram al-Ghazzawi told MEE. “I wished I could do something, anything, to free her. We cannot imagine our lives without her,” she added. “Umm Ihab is universally loved because she supports everyone in need,” said Zina Amr. “When any of us is arrested, Umm Ihab is always the first to come to our hearings and to welcome us when we are released. Her tenderness and defiance is an example for all of us,” added Amr, before handing out letters of support that the women have received from Algeria in which Algerian women stress their solidarity with Palestinians in Jerusalem. Umm Ihab, as well as approximately 20 women present in Bab Hutta last Wednesday despite the cold weather, are among 40 Palestinian women who have been banned from entering al-Aqsa mosque since September. The women’s names were on a list distributed by the Jerusalem police commander Avi Bitton on 3 September 2015. Palestinians call Israel’s “blacklist of troublemakers” the “golden list” and far from scaring them into submission, the ban bolsters the women’s morale. The women initially held daily gatherings outside Bab al-Silsilah or the Chain Gate. They say that while Israeli repression, which involved beatings, and verbal and physical harassment may have succeeded in forcing them away from their usual gathering place at Bab al-Silsilah, they have simply started meeting at Bab Hutta instead. “We didn’t move to Bab Hutta looking for safety, but we are adamant to reassert our presence here and we wanted to stay as close as possible to the mosque,” said Umm Ihab. The group comes to Bab Hutta, one of al-Aqsa mosque’s gates, every morning and they stay there until the afternoon. Before their open-ended ban from al-Aqsa mosque, the women used to give religious lessons that ranged from reciting and memorising the Quran to the interpretation of the Hadith (Prophet Muhammad’s sayings), in addition to lessons in Islamic jurisprudence and history, with a focus on the history of al-Aqsa mosque. They believe that it is impossible to counter the narrative of settler groups that claim authority over the place, such as the Temple Mount group, without fully grasping the intricate history of this place. 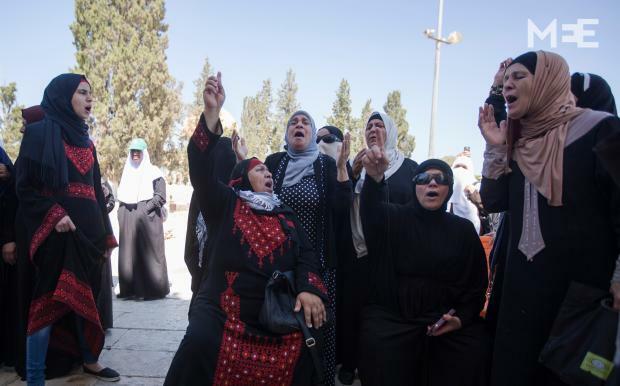 The women essentially feel that it is their duty to protect the holy site from the increasingly regular and provocative incursions by Israeli settler groups who tour the area. They frequently call out “Allahu Akbar” – “God is great” – to remind Jewish visitors that the compound is still in Muslim hands. For many of the women whose names were put on Israel’s list, this was not the first ban. Umm Ihab herself was banned from the mosque for several months three years ago. 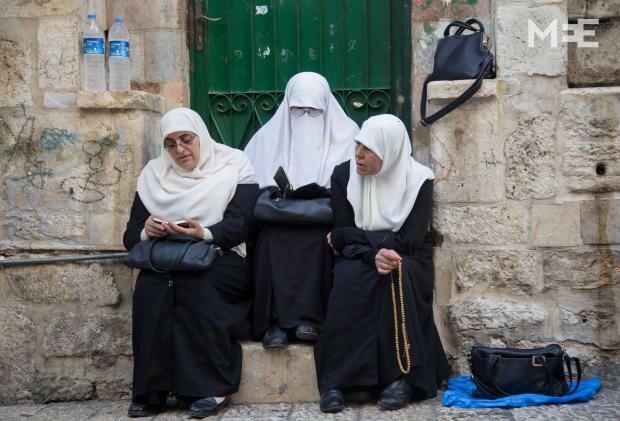 The ages of the women banned from Al-Aqsa range from 18 to over 70. 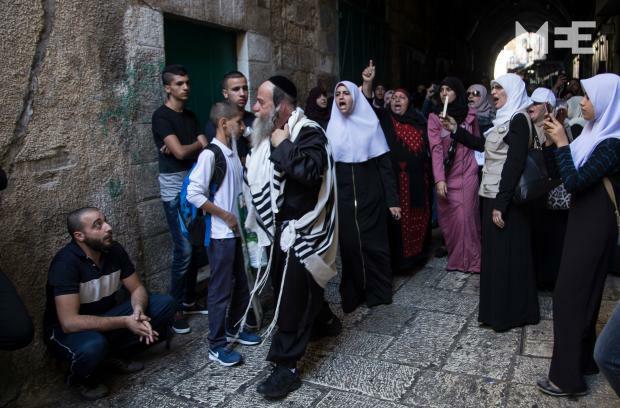 Israeli authorities claim that their presence is an incitement to violence and that it provokes settlers and police, while the women believe that it is their inalienable right to pray in al-Aqsa and to defend it from what they perceive to be invasions by settler groups, backed by the Israeli police and military. “If there is anyone who incites, it is the behaviour of the Israeli police,” said Shamiyeh Muhtassib, who had tried to enter the mosque earlier in the morning but was turned back after showing her identification card. “They beat us, fire sound bombs, drag us along the ground and then pretend that they are the victims,” she said exasperatedly. Umm Ihab’s brief arrest this December was yet another chapter in Israel’s ongoing targeting of the women whom it accuses of belonging to al-Murabitat, the Steadfast Women of al-Aqsa. A resident of the East Jerusalem village of Issawiyeh, al-Jallad was arrested by Israeli police last week when she spent three nights and four days in Ramle prison and was not allowed to receive her medical pills during the first day. She was interrogated about providing assistance to banned groups and receiving funding from banned groups, two charges that al-Jallad strongly denies. “In the end she was released on bail without being charged with anything, but it is likely that Israel’s persecution of her and of the other women will continue,” al-Jallad’s lawyer, Khaled Zabarqa, told MEE. This was al-Jallad’s very first arrest, but while she underwent this experience for the first time at 61, her son Wassim was just 17 when he was first arrested. Wednesday was supposed to be the day for her monthly visit to her son, but her arrest and the fact that she now has a criminal file meant that she was prevented from visiting him. Wassim’s first stint in prison lasted four years after he was charged with belonging to Hamas. Briefly after his release and marriage, he was arrested again and sentenced to 15 years in jail for transporting a Palestinian suicide attacker. Umm Ihab believes that Israel is employing different tactics to crack down on their activism and that their tactics are not limited to the use of force. Many of the women told Middle East Eye that not only were they targeted individually, but that their husbands and fathers were interrogated as well. “This is not a new tactic against women. They believe that since we live in a patriarchal society, they can make our husbands and fathers police us. What they fail to understand is that most women here don’t place anything or anyone above their feelings of duty towards al-Aqsa,” Zina Amr reiterates. Umm Ihab admits that the tactic of punishing family members of women has occasionally borne fruit and that some women have been forced back to their homes under family pressure, but she believes that overall this tactic had the opposite effect on most women. Islam came from outside Palestine, it’s roots are in the Arabian Peninsula. They want to throw off the yoke of Israeli rule only to submit to an Arab-Islamic one. Would of been a much more interesting article if the author explored and critiqued this.